These layered images are all meticulously constructed from the reassembled archive of Norman Schroth, a mid-20th century commercial portrait photographer. The formal portrait often served as a self-edifying confirmation of one's middle-class status as well as a testament to a wholesome and flawless public image. Prominently displayed formal portraits became a vital trophy in many homes as the happy nuclear family acted as a litmus test for the success of the American dream. Over many years I furiously hunted down and reassembled Norman's oeuvre of nearly 12,000 images and have spent hundreds of hours sifting through and cataloging its contents. I began compiling and separating similar poses and likenesses by age and gender and stacking them to produce these four images. Each print is comprised of twenty photographs of completely different individuals that have been carefully aligned and layered. When a woman, baby, child, and man are produced and all brought together, the group of photographs show an ideal family unit in mid-century America. These black and white photographs become frenetic, ghostly reminders of a society's effort to mainstream identity into normative roles of the nuclear family. I am interested in the continual, obsessive documentation of life via my cell phone and the multitude of participants who aid in the development of our contemporary social archive. #weouthere acts as a physical representation of an online experience, illuminating contemporary modes of photography as forms of self-preservation, surveillance, and resistance. In a post-Stonewall era, the American gay bar became a safe haven for the homosexual and queer communities. Prior to the advent of Internet social networking, these bars and other communal spaces were the only places available for social interaction. As ever-changing technologies make it easier to connect to persons with similar sexual identities, the gay bar faces the threat of becoming obsolete. Today, gay-oriented mobile phone applications like Grindr, Scruff, and Growlr make it more convenient to meet people outside of the "traditional" gay bar social scene. Will these applications cause the demise of gay communal spaces? American Gay Bar investigates the current status of homosexual establishments, devoid of people, as a social commentary on what may occur if these spaces lose their clientele due to the convenience of mobile technological platforms. In a heteronormative society, the gay bar becomes a place of necessity, preserving a physical space for the gay and lesbian communities to retreat for comfort or public engagement. This project uses stitched panoramic digital images to document cemeteries throughout Shelby County, Tennessee. The project focuses on cemeteries which have been closed, forgotten, abandoned, semi-abandoned, removed, or “repurposed.” Most of the locations I photograph are not on the map. My research emphasizes cemeteries which include African Americans because these are the most neglected burial grounds. Cemeteries are plots of land set aside to house the bodies of the dead. But, they are much more than that. They are both monuments and memorials to those who came before. Often cemeteries serve as invaluable historical records of the population of an area. Cemeteries are also memorials to our ancestors. Stealing a headstone, or bulldozing a cemetery is profoundly disrespectful to the dead. But, it is also a way to rewrite the historical record. Some dead are memorialized. Others are covered by parking lots, community centers, and parks. This difference speaks volumes to our societal values. While the region is very proud of its history, historical construction has necessitated excluding the vast majority of those who built the area. Most Southern histories focus on the aristocratic planter class, offering only a smattering of anecdotes about those whose stories do not fit neatly into the narrative of the “Old South.” Sacred to the Memory highlights histories of those who have been written out of that legend. 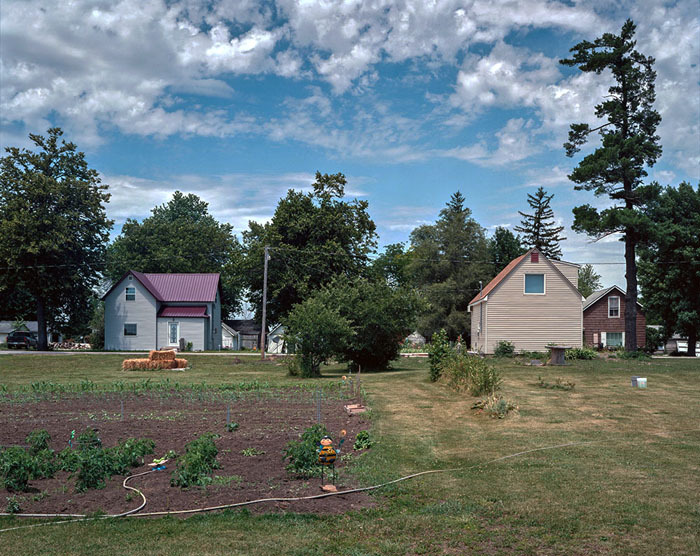 In the past my work has examined racially charged social and political history via landscape photography. This project goes a step further capturing the last physical manifestations of the dead. Thus Sacred to the Memory is both a landscape and portrait project. I have selected a series over fifty towns in rural Iowa with famous names, such as international locations (Paris, Jamaica and Rome) or familiar namesakes (Orient and Jefferson) to document. So far I have traveled to over forty, creating photographs that juxtapose the image each namesake evokes against what I discover in these rural spaces. I use the namesakes to explore the differences between easy assumptions and the reality of a small town Iowa: commonality and dissonance. The namesakes serve the project two ways. First, they provide means of "random" selection. I know little to nothing about each locale prior to arriving to photograph. I select it for inclusion solely because of its famous moniker. Second, I use my knowledge of the namesake to influence how I depict each site. I intend to use these images to reveal the manipulative power of the lens while leaving the viewer with a playful look into how we perceive a place. The connections I am forging are not efforts to search for remnants of a bygone era, but rather an attempt to create new links by careful observation. Before traveling to each town, I conduct brief research about the namesake location. I then arrive with a list of descriptors that my research provides. For example, as I photographed Turin, Iowa, I kept the list of concepts rolling in the back of my mind like a mantra. My list contained items such as; Italian mountains, capital of the Alps, the holy shroud, Olympics, cathedrals, ancient architecture, wealthy, classic and divine. I strive to meld the two together; to see the influence of the namesake in the Iowa locale and embody the mood of the Italian town. Living in a time where histories and current realities cast difficult and complex shadows, the assignment of meaning is suspect. My photography looks towards greater significance in the context of a deep contemporary complexity. In an age where we have recognized difference, it considers what our relationships to one another as human beings are now and could be. At a time of popular irony and cynicism, it imagines the possibility of wonder. I make still photographs and video installations of human beings in specific and intersecting cultural contexts, pausing viewers within micro-moments displaying multiple, layered perspectives. These works, saturated with color and richly textured, slow down and sometimes stop the view, visually dwelling on how individual perception changes what we experience. Considering the role of perspective in questions of race, religion, history, and belief, they offer a meditative consideration of the role of positionality in the creation of our reality. The question of connection swirls at the core of my artworks, both between human beings and with our world. Conversations & Confrontations follows my own autobiographical threads to explore modern day instances of oppression. From racial segregation embodied in a Southern transit car and prayers at disputed holy sites in the Middle East - my photography and videos address localized and specific places that encapsulate the always complex and often conflicting meeting points of identities and cultures. The people and places within this overall project illustrate moments from reality seemingly randomly captured, yet carefully composed, suggesting the many individual stories that intersect within them. These works enunciate humanity and difference. In my willingness to examine my own relationship to dominance, I invite viewers to consider these realities in the world, locally in paths they themselves travel, and within their own lives. Personal and academic experiences swirl together at the core of my research, moving from fact to fiction and back again to consider their dialogue within human perspective. Similarly, my ongoing interest in people and the implicit value of their experiences leads me to consider the specific content that I do. Informed by my background in ethnography and critical studies, when delving into instances of oppression, for example, I choose to follow autobiographical traces and thus connections to my own life. In my willingness to examining my own relationship to dominance, I invite viewers to consider the existence of these realities in the world, locally in paths they themselves travel, and within their own lives. My research plays upon notions of subjectivity and objectivity to invite viewers through what they see into an exploration of how they see. I am interested in the residuals of every day experiences, physical and emotional, and how they create the elusiveness of self. Throughout my career, I have consistently used the body and the landscape as points of reference to question assumptions related to what we find worth noticing and to challenge conventional notions of beauty. The places, myths and relationships that form identity are the motivation for my work. The Sketch 4 I.D. series has been developed out of an interest in the marks and scars on trees. Creating montages from these shapes by combining them with human skin and text, I am investigating the physicality of surface and the process of aging. Ultimately, all my work is about marking, decay and the formation of identity. These images function like archeological remnants – a deconstruction of both text and image recombined to create a new context. They are fragments of the everyday: the trees are surrogates for the body while the text, derived from stories and letters, manifests as trace memory. As identifiers, they are unformed signifiers – sketches where words and image get lost within each other. On July 21, 1945 President Truman authorized the use of atomic bombs on Japan during his stay in Potsdam, Germany. He was attending a conference to meet with Stalin and Churchill to discuss the future of defeated Germany. The photographs are possible views that President Truman may have experienced, staying at his "Little White House" and the office in Cecilienhof where the conference was held. In the series Hair, the photographs and video break down the building blocks of race, gender and masculinity through the representation, removal and reconstruction of hair. The work explores how hair, an instrumental physical identifier in one’s being, politicizes and dictates how we scrutinize a person. Dissecting the general, military, and Buddhism representation of preferred hairstyle, the work focuses on how masculinity is portrayed and assessed.